It's tough to be an apocalyptic mech show in the post-Evangelion anime industry. The classic giant robot tale was popular enough to not only spawn countless imitators, but it also managed to inspire some good series in the genre, as well. Thus, not only is any show that dares to feature a giant robot compared to Eva, but it's compared to all of the stuff that's come after it. Brain Powered, RahXephon, Argentosoma - the list goes on and on. Yet, this is the world in which Fafner's creators decided to produce it, and so this is the world in which it shall be judged. Overall - it actually has held up rather good, so far. In this, the second volume of the series, the writers show exactly how high the stakes are in the battle between the last surviving humans on Earth and the Festum. While the series will likely elicit a laugh here and there, this is first and foremost an angsty, angsty drama. Perhaps that's the way it should be. After all, after the mysterious, gigantic Festum first arrived, obliterating any semblance of sentient life on the planet, the situation was rather bleak for humanity. Our heroes were raised on a mobile floating island under the control of a secretive group known as Alvis. As is typically the case with any sort of giant robot show, only children are able to pilot the island's most powerful weapon - Fafner. Fafner isn't merely one large robot, but part of the Siegfried System - a highly advanced collection of metal guardians and human pilots serving as the final defense against the Festum. At first, the inhabitants of Tatsumiya Island were protected by a gigantic invisibility field that cloaked the entire man-made habitat. However, their reprieve from the watchful eye of their faceless aggressors was only temporary, and now Alvis is putting its considerable thinktank through its paces. Fafner sports a rather diverse (if stereotype-speckled) cast, from the uninitiated unwilling savior primary protagonist (Kazuki Makabe), his gruff leader of a father, a waiflike anemic cutie of a pilot named Shoko, Kazuki's genki tomboyish childhood friend, Maya, and his aloof wise-beyond-his-years best pal, Soshi. The general plot has been largely influenced by Wagner's Der Ring des Nibelungen (The Nibelung's Ring), and the music shows the plot's operatic heritage. The show's music is every bit as dramatic as any other traditional giant robot series, squeezing out every tearful drop of emotion whenever tragedy strikes the island. It is hauntingly beautiful, and while it may not be appropriate car-thumping music, it works exceedingly well in this particular series. While the show's music is excellent and the premise is somewhat of a common topic in anime, it more than holds its own in terms of animation. The artwork in the series is beautiful; from the colorful renderings of Tatsumiya Island, to the impressive mechanical designs of the Siegfried System's many components, all the way down to the alluring character designs, and finally, the unique coldly metallic look of the Festum themselves. Production I.G. did an excellent job animating the series, offering visuals that blend computer graphics with 2D animation almost imperceptibly. I have to admit that a flashy show that borrows elements from its predecessor is far and away preferable to a series that is not only unoriginal, but ugly, to boot. 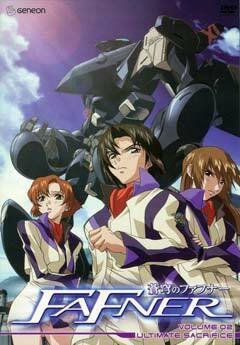 Accuse Fafner of Eva envy all you want; it's still a darn impressive-looking series. Extras are not especially impressive, though the dual-sided clear-case cover is always a nice feature when packaging a disc. Digital extras include a cover gallery featuring the original Japanese artwork and a few previews of other Geneon shows. I like trailers as much as the next guy, but I'm still not convinced that advertisements should be classified as "extras." My copy of the DVD came with a nice booklet with some of the show's pretty artwork in the middle as well as a small shrinkwrapped set of collectible cards. Ultimately, if you're tired of the giant robot apocalyptic storyline, then Fafner will probably not do anything new for you. Perhaps slightly offbeat shows like Overman King Gainer would be more up your alley. However, if there's nothing more stirring than angst-ridden metal-on-metal action supported by the rousing boom of a full symphony orchestra, then this is your show. I won't be able to judge the true worthiness of Fafner until I've experienced the entire series. Until then, I'm happy enough with what Xebec has provided. bilingual DVD / 4 eps. / 100 min. Geneon / Xebec / Production I.G.